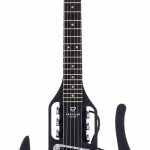 Our overall winner is the amazing SLG200S Silent Guitar from Yamaha! 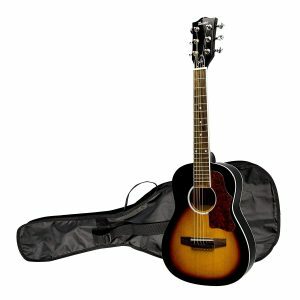 What is the best guitar to take travelling? 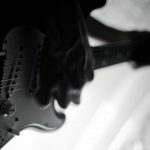 This ultimate guide is here to answer all of your questions, and provide answers to many things you may not think of when researching the best travel guitar for you. From folding and compact options to our top selections in 2019, and even our top pick of small and miniature travel guitars for when you don’t have a lot of room to spare, you’ll find what you’re looking for in this guide. With the continued rise of millennial travellers and remote/nomad freelancers ditching their desks for a plane ticket, there’s never been a better time to get yourself a travel guitar. And, whether you’re an expert player or want to get an instrument for travelling to keep your mind entertained, we couldn’t recommend a better travel companion than a trusty six-string friend. Let’s kick this guide off with our top 15 selections, or you can simply head to the top of this page to jump to a section that appeals to you. Kicking off this list is the ‘Mini O’ travel guitar from Cordoba. Just as exotic as the name suggests, this fantastic little axe is fully sized at the neck and the nut, meaning it’s perfect for players who want to practice their scales, alternate picking or legato and finger strength on the move. The guitar is made of a west-african wood, Ovangkol, from the Guibourtia ehie family. This material gives the guitar a thick tone with resonance, despite the shrunken size. It also offers a sturdy alternative to cheaper woods, great for travelling around with (especially in your carry on luggage). And, don’t worry, if you’re already worrying about whether you can take your brand new instrument as a carry on… You can. 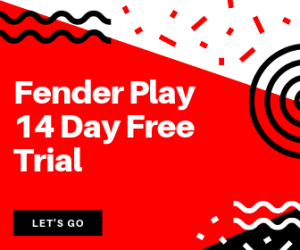 We recommend this guitar for players looking for something a bit different in terms of build, with enough sturdiness to withstand cabin baggage bumps and scrapes. Also, it’s fantastic for players looking to improve hand strength and coordination on the move. 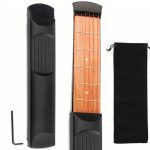 This is easily the most common of travel accessories for shredders, learners and generally any player who is obsessed with finger strength, scales and legato. 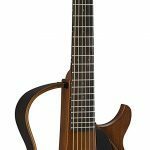 Whilst maybe not as aesthetically pleasing as many on our list, and clearly not a ‘guitar’ (let’s face it, it’s just a neck), the ShredNeck is still fantastic for maintaining technique and finger strength when on the move. The frets replicated are from 12 to 24, and it also includes a miniature gig bag and even fully functioning tuning heads (so if you love a bit of drop-d action, you’ll never be away from it). 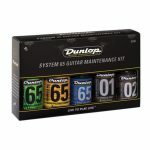 Recommended for seasoned guitarists with little spare time who want to maintain finger strength and legato technique when on the road. This one is similar to the ShredNeck, however is a bit more expensive and much more advanced. 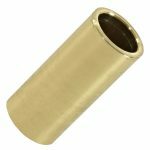 Better suited for acoustic guitarists, the Anygig acoustic neck is fantastic for beginners looking to get to grips with the wider neck of an acoustic guitar. 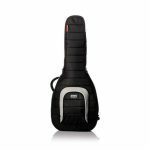 You can also DI the guitar straight into your amp or laptop, and it also comes with a free travel bag and audio cable – Perfect for throwing down acoustic chords when there isn’t a full-size acoustic guitar at hand! 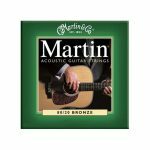 Recommended for acoustic guitar players and recording artists who always need an acoustic guitar at hand. The ultimate winner of our definitive travel guitar guide just had to be the SLG200S from Yamaha. 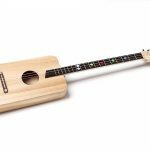 Almost completely silent, the guitar is not only a go-to for travellers, but also for home players and even studio musicians who want a light, easy to carry and fully functional electro acoustic that doesn’t cost a fortune. 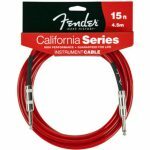 The steel strings and maple body make the tone of the guitar rich and thick when plugged into an amp or via a laptop, or you can opt for the near silent option and simply play the guitar as it comes. The body is fully collapsible, with SRT technology from Yamaha which is the source of the full-body resonance. What does this mean for the average player? Put simply, the guitar sounds like a classic dreadnought, without the bulky size or shape. We fully recommend this guitar for travellers, studio musicians and even beginners with little storage space. 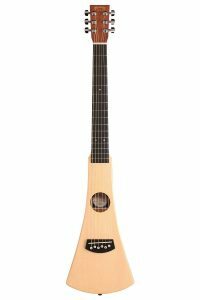 The fully collapsible, electro-acoustic body is what puts this guitar at the top of our list. 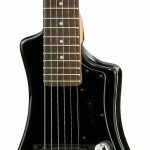 For the beginners on a budget we have the Trav 1 from guitar brand SX. With a solid spruce top and mahogany body, the build quality is certainly not reflected in the guitars modest price. 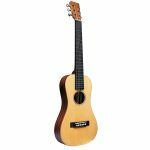 With a rosewood fretboard this guitar is great for novice players who really want to get to grips with an acoustic, without having to stretch to a standard dreadnought. Due to the build quality, the tone of this guitar is also fantastic. 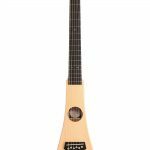 An all round brilliant instrument for young children, players with small hands, and makes a great introductory guitar for a birthday or Christmas present. We recommend this guitar for parents looking to buy their children a beginners guitar. There’s nothing we love more than minimal guitars that just simply get the job done and don’t cost an arm and a leg. 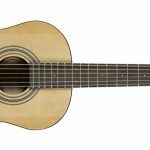 The lightweight six-string from Traveler has been highlighted as the ‘smallest and most lightweight travel guitar on the market’. Built from a full maple body, what the guitar lacks in weight it makes up for in build quality. The lightweight material is also tough, so don’t worry about getting this one into the overhead lockers on a plane! Other defining features include a detachable body and a built-in pickup for gigging on the move. Our runner-up in this guide, we recommend the Traveler for frequent flyers and players looking for the lightest option in this list. If you’re a fan of branded guitars, or are looking for a brand-name for a gift, then you might as well stop scrolling and pick this one up. The Gibson Maestro is a basswood build at 3/4 the size of their standard acoustics. Fantastic for budding Ed Sheeran fans or children who want an inexpensive option for exploring the world of the guitar. The body is also chrome plated, so again is great for growing families. We recommend this guitar for families on the move, and as a gift for the brand-conscious musicians out there! One look at this guitar instantly tells you why it’s suited for backpackers. The long, slender body is fantastic for strapping onto a rucksack, into a travel bag, or checking in when travelling. The neck is true to size, with tonewood back and sides and a firm, solid spruce top. 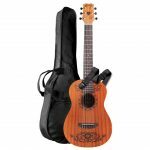 The guitar also comes with a travel bag as standard, and is perfect for seasoned guitarists accustomed to steel strings who want to keep up their playing whilst island hopping. Recommended for backpackers on long journeys and blues guitarists who need to practice pentatonic scales when on-the-go. Now, whilst we are including 3/4 guitars in this list, the exercise neck from Luvay is clearly the smallest in the guide. 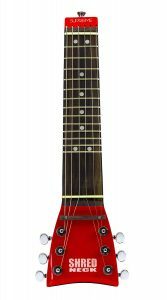 It’s also the cheapest option, so if you’re looking for the cheapest travel guitar option then you cannot go wrong with the Luvay practice neck. 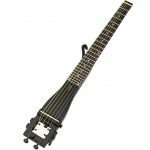 With 6 frets, you can actually travel with this in your pocket or carry on with ease. The neck is surrounded by a tough plastic shell, and is designed around a standard neck so typical curvature is expected. This means that, when going through strengthening exercises, hand positioning is not awkward or forced. Recommended for travellers on a budget or for one-off use. The Washburn travel guitar is one of the closest we can recommend to a standard acoustic guitar jumbo body. With a mahogany body and rosewood fingerboard, the Washburn acoustic is basically a standard acoustic shot with a shrink ray. The style and build quality is exceptional, and we’re particularly fond of the body shape. The guitar has a scale of 24″, with a case for travelling included. Perfect! We recommended the Washburn acoustic for players who want a smaller guitar with a standard jumbo shape. 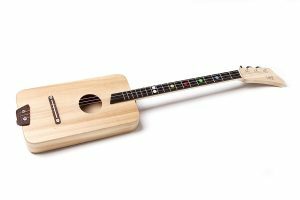 The Loog 1 is branded as the ‘ultimate guitar for parent and child bonding’. Looking at this miniature, it’s very easy to see why. 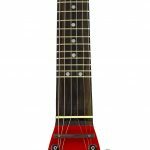 Not only does it work as a compact option for travelling, the ‘1’ only has 3 strings, comes unassembled to promote parent and child bonding, and comes with vibrantly clear fret markers for ease of teaching those pesky beginners chords. If you are a parent travelling around and want to take a gift home, or want your child to become the next Hendrix and want to pack a gift to surprise them with, then make sure you check the Loog 1 out. We can all be a sucker for a quirky guitar. If you’re friends with an artist or are a budding artist yourself, you’ll love the Coco Mini collaboration from Cordoba. The body is built from an incredibly durable, premium mahogany, coloured naturally with a body design reminiscent of a freehand pattern or piece of art. 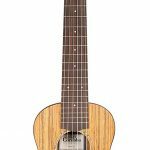 Made in conjunction with the film ‘Coco’, the guitar is a Hawaiian-themed mini acoustic which is perfect as a premium built guitar ideal for the beach and made to withstand the heat of the beach and the glare of the sun. If you want something a little more unique, definitely give this little gem a look. The lucky thirteenth choice on our list is easily one of the more expensive, and arguably the most technical of the bunch. having already covered the introductory offering from Traveler, we’ve now branched out to the pro series. So, what are the core differences and, more importantly, why is the price significantly higher? The first glaring difference is the build quality, with a full maple body and luxury satin finish. 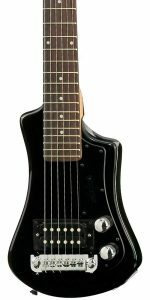 The guitar is also an acoustic hybrid, with unique Piezo dual pickups and a detachable body to really simplify the logistics process. If you really want to spend a fair amount of money on a travel guitar that is studio quality, diverse, and worth every penny, then make the right investment with the Traveler Pro series. Unless you live under a rock you’ve no doubt heard of the brand in the penultimate position in our list. 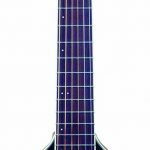 From Hofner comes the Shorty, a beautifully retro travel guitar and miniature for all of the on-the-go rockabilly and blues styling you could ever ask for. Whilst strictly marketed as a travel guitar, this is arguably much more. A hark back to early 50’s era players and a homage to the country and early blues pioneers, this is simply a cool guitar that will be just as at home in a home studio than it will in an airplane overhead locker. The Shorty is crafted from basswood with a maple neck, with a singular Hofner humbucker for that perfect retro style. Recommended for roaming fans of rockabilly and blues. The final guitar on our list is an old favourite from the authors here at Guitaarr. 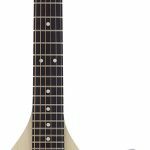 The MA-1 is a casual, stripped-back and all-natural travellers guitar from giants of the six-string world, Fender. The guitar has a shorter scale length of 23.3, resulting in 3/4 size with a shrunken neck for proportional attributes. An Agathis and Sapele blend, it’s both light and durable with a tone that, whilst not too rich, still rings true through the steel strings and makes resonating chords a breeze. Want a simple travel axe that gets the job done with a smaller overall size than most? The MA-1 is your go-to choice. You’ve seen the guitars, now what about the amplifiers? From pocket amps to shrunken-down classics, you don’t have to rely on putting your ear to the neck of your electric to make out whether or not your pinched harmonic really is pinched! 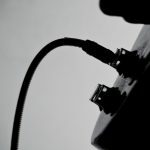 We’ve outlined our five favourite amps for taking on the road, on a journey abroad, or simply for the guitarist who is always on the move and needs a light and flat-friendly option when it comes to guitar amplification. A travel amplifier from Fender was always going to be at the top of our list. The mini deluxe certainly lives up to its name, with tone, gain and volume knobs for full versatility of playing styles. The gain setting is also surprisingly strong, packing a punch and perfect for laying over a lead guitar when on the move. The build is also sturdy, built more like a standard Fender amp (just a miniature version). It’s also a little on the larger side for a travel amp, however the size at 11.4 x 7.5 x 3.5 and weight of 13 ounces still justifies naming the amp as such. We’d recommend the deluxe for travellers with a car or van, rather than those catching regular flights due to the slightly bulky build. Fans of Shakey Graves may already have purchased the Honey Tone. 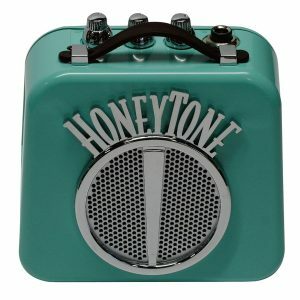 A firm favourite of country and blues musicians, the Honey Tone N-10 has a deliciously gravely distorted tone, mixed with creamy cleans and a reactive tone knob to blend the two together. Priding their selves on delivering vintage tones, Danelectro have gone from pedals to mini amps as a natural progression, keeping their natural tones at the heart of their products. At Guitaarr this is something we can appreciate, as they’re doing what they do well! The amp is fantastic for travelling on airlines and coaches, as it fits in overhead lockers or baggage compartments, and is also sturdy and well-built. This is easily the best amp in our list in terms of a mix of a true miniature, and a standard amp. 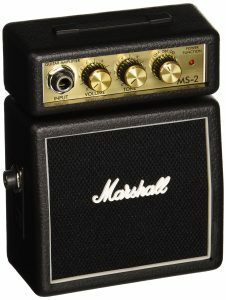 At just 5.6 x 5.8 x 3.1 the amp is also one of the smaller on the list, however is slightly heavier than the Fender Deluxe at 15 ounces, simply due to the large metal logos and additions (however these can be removed and reinstated for ease of travel). We recommend the N-10 for fans of country and blues looking to partner their guitar with the perfect miniature travel amp. The MS2 is often the most commonly purchased travel amp, and is the go-to for guitar teachers and musicians constantly on the move, who require quick access to a reliable amp. First of all, the options of portability with the MS2 are fantastic. 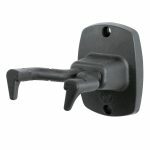 You can clip it your pants like Jack Black, simply carry it around, or place it on top of most surfaces. It’s a simple build, sturdy and light, and whilst the gain isn’t fantastic compared to other portable amps on our list, it certainly gets the job done and has a clean tone that overshadows and gain discrepancies. 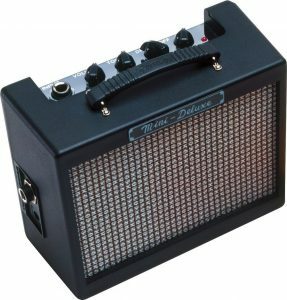 You can also plug and go with your headphones, making this the ideal practice amp for guitarists on the move. We recommend the MS2 for guitarists looking to regularly practice whilst travelling. Don’t let the size fool you, what the Metalbay Portable lacks in size it makes up for in portability and tone! The ideal addition to any guitarists arsenal, the portable is usually used by practicing guitars or players in flats and apartments who don’t want to keep the neighbours up. Ideal for rock and metal, the portable amp comes with a distortion setting and rechargeable battery so you can really get to grips with solos, techniques, and all those good things! Recommended for rock and metal fans looking to practice their scales and speed runs on the move. 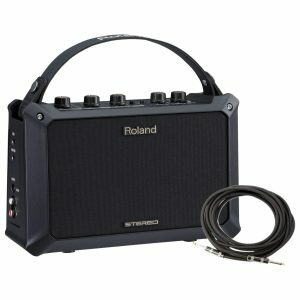 Last on the roundup of our top 5 amp for travelling is the Mobile AC 5W from Roland. Famed for their ‘Cube’ amp (a firm favourite of buskers and gigging players), Roland have shrunk their amplifier offering down even further with the AC 5W. As the name implies the amp is a 5 watt stereo, aimed at acoustic guitarists with an additional microphone output and chargeable batteries for busking and gigging outdoors. 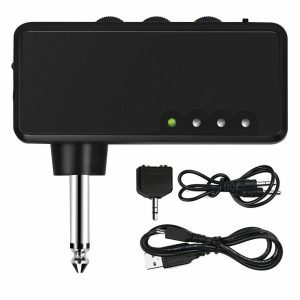 We recommend this amp for travelling buskers and acoustic guitarists looking for a guitar/microphone solution. Take a look at our favourite reviews and demos of the guitars and amplifiers in this guide… Happy listening! We’ve all been there. 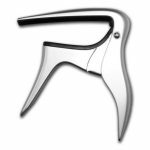 You purchase your staple items, but whether it’s a capo, a repair kit, or a strap that you can rely on, accessories are usually thought about when it’s already too late. Check out our must-haves below. Can I take a guitar as a carry-on luggage? It’s common to think that travel guitars are flimsy because of their cheaper costs, but the whole point of a good-quality travel guitar is that it can withstand wear, tear, bumps and scrapes. If you’re really worried about sturdiness, consider a metal or steel range such as the Traveler Pro-Mod X series. 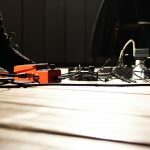 We’ve reached the end of this guide, hopefully you’ve been able to find the best guitar, amp, and even accessories to make travelling as a musician as stress-free as possible. 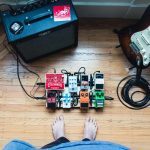 If you loved this guide then be sure to take a look at our list of guitar pedal guides, or if you’re looking for a new guitar then don’t miss our hugely popular seven string guitar buyers guide!